Grab a snack, because you’ll get hungry as you read this interview with Azamara’s Corporate Executive Chef Robert van Rijsbergen. With a lifelong passion for fine cooking and the sea, he was born for this role. Bon appétit! I was born in The Netherlands and grow up in a province called Zeeland in the southwest of Holland near the Belgium border. It’s an area surrounded by the sea and beaches with white sands and clear water. 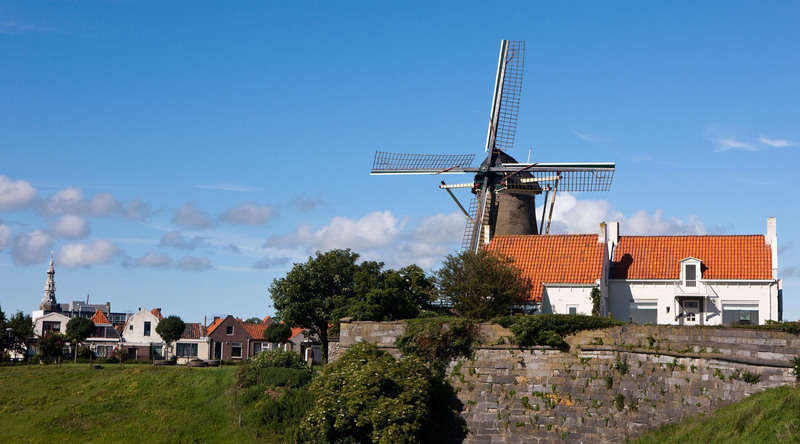 Zeeland is known for fresh seafood like mussels, oysters, lobster, sea bass, turbot, codfish... I love it! Q: How did your interest in cooking and cuisine develop? I always helped my mom in the kitchen when at home; she loves to cook. For any party or special event, we worked together to prepare the food and present it, which was lots of fun. At the same time, my dad was a Captain on a dredging ship. We Dutch are masters of the sea, of course! Many times he went away for long periods, with jobs all over the world. But when he came home, I was fascinated with his stories and traveling experiences. Sometimes his ship would bring him to Rotterdam during the summer holiday, and then I stayed onboard with him, wandering around this huge ship...and visiting the galley onboard, of course. So knowing I love cooking, and wanted to be at sea, I kind of combined it and became a chef at sea, the perfect job for me. Q: Describe your career milestones and how you came to Azamara. During my culinary training, I worked in several restaurants in Zeeland, but decided to leave “home” and go to the big city restaurants, which were famous for their chefs and Michelin Star(s). The first Michelin Star restaurant I worked for was the Hotel Corona in The Hague, which had one Star. It was just outside the Dutch ministry, so the Prime Minister and others came to it. The Chef was Dutch Master Chef Robert van Kranenborg, and he taught me authentic classic French cuisine. It opened my eyes, working with the best ingredients delivered each week from Paris. I was privileged to work there for two years until Chef Kranenborg decided to move on to the Amstel Intercontinental Hotel in Amsterdam. I joined the Royal Dutch Navy for one year, working as an officer’s chef, then followed Chef Kranenborg to the Amstel. I stayed another three years, and this restaurant earned two Michelin Stars. I worked a total of five years with Chef Robert van Kranenborg, and he made it possible for me to get to where I am now. I learned so much from him, he truly is my Master teacher....and I am very thankful for that. Q: Tell us about your family, where you live now, and how you spend your free time at home. I live in downtown Amsterdam with my beautiful wife Cecilia and our 6 year-old son Ryan. I met my wife at Sea Dream Yacht Club where we worked together for several years. Now she is at home, taking care of our boy and also working as hostess at a five-star boutique hotel. I will be traveling a lot, between the ships, Miami and home. Q: What are your responsibilities/priorities as Executive Corporate Chef? I will oversee the culinary operation including menu development, new recipes, purchase control, culinary training, recruitment and other things. My main goal will be to bring the Azamara Club Cruises culinary experience to the next level, with the same high quality experience on both ships. One of my first projects is to turn our Aqualina Specialty Restaurant into a Italian Specialty Restaurant with two different menus, changing every five days. Italian cuisine is loved because it is fresh, colorful and allows simple yet stylish and inspired presentations. We will be creating Italian cuisine with a twist, for instance, vitello tonnato cooked with a tuna loin and wrapped in veal. Q: What trends in international cuisine are most exciting to you? Organic is very popular, of course. There are fresh markets on every corner in Amsterdam and I love to explore them whenever I’m home. This is a worldwide trend—fresh local food—and it is so exciting to be a chef right now. I love Asia and its cuisine, and love visiting the markets in Bangkok, Hong Kong and India... seeing all the fresh exotic products, the different spices and herbs. It’s great cooking with new and different ingredients. Q: What are the tricks for keeping food “fresh and local” on a ship? All our provisions are delivered on embarkation day, and we have huge walk-in fridges that store foods separately, each food group at the ideal temperature. One fridge for produce, one for fruit, one for meats and fish. Dairy items are stored in fridges for dairy only. It is like having our own supermarket onboard. On a daily basis, the cooks order food, I check against the budget, and then order it. Throughout the cruise, if we run short on a particular item, we buy it locally. We also send our chefs ashore on Chef’s Walks in places like Barcelona, St. Tropez and Sorrento, and they will purchase local ingredients that are used in our Specialty Restaurants. You can’t do that every day of course, but it’s wonderful to purchase amazing local specialties at the source. Q: Azamara guests are passionate about certain items on the ship menu. Based on your experience, what are their favorites? We get great feedback about our menus in Discoveries Restaurant. It has a wonderful selection and it’s all cooked à la minute. Favorite items are the Filet Mignon, our healthy options, lobster dishes, fish with couscous and a lemon-oil dressing, pasta dishes...and don’t forget the homemade pastries. Our lava cake is extremely popular. We have 15 people working pastry alone, a 24-hour operation. Our buffets are also very popular. Every night we serve a themed buffet like Italian, French, Asian, Mexican, Indian...again, with à la minute fresh cooking right in front of the guests. They love it! Q: We live in a golden era of cuisine that is both healthy and delicious. Azamara already offers a large selection of health-conscious menu choices...give us a hint about what’s coming next. I love creating more healthy desserts, using less cream, sugar and butter. We have come up with a Date and Nuts soufflé, sugar free, fat free and gluten free... available in our specialty Restaurant and a very popular choice. What’s coming next? Maybe someday an organic restaurant at sea, working with only local organic ingredients. Q: Everyone wants to ask a chef: what’s your favorite meal after a long day at work? I rarely eat late or any time after dinner. But if I have to eat it will be a nice salad with avocado, pine nuts and tomato, and a fish fillet with olive oil and lemon.That is a light meal that makes me happy! I do love a perfectly cooked steak like Filet Mignon served with risotto and a nice red wine on the side. I rarely eat burgers and pizza...and I stay away from junk food. At home I’m the one cooking breakfast, lunch and dinner because I love being in the kitchen. The last time I was home my son’s school had a theme of sea and ships, and I was invited to do a presentation. I wore my chef’s uniform and talked about the ship and crew...our favorite foods...and I made fresh pasta. That was lots of fun. Q: What would you cook to impress the judges if you were on one of those ultra-competitive TV chef shows? I would prefer to be inspired on the spot... to be on a show where the chefs are in front of a table piled high with the freshest ingredients, from herbs to vegetables, meats and spices, with two hours to make a four-course lunch menu. I would simply choose the items and start cooking, just like at home—I head to the market, see what’s available and go from there. Q: What famous chef (living or not) do you admire most, and what did you learn from him or her? Of course my Master Chef Robert van Kranenborg, but during my early years in the kitchen, I started to collect cookbooks of famous chefs. My first cookbook was from Marco Pierre White, the youngest three-star Michelin chef ever. His cookbook White Heat is a classic, a must-have for every chef. He invented the perfect roast chicken. Q: What’s your most memorable restaurant meal? Once I went for lunch at the Le Louis XV Hotel de Paris in Monte-Carlo. Alain Ducasse was the chef. Outside on the terrace, we ordered the 8-course menu degustation, but there was no Foie Gras on it, so before we started the menu we first ordered Foie Gras...this in combination with a nice wine-paring menu. You walk into the 18th century; the flowers, music, food and service were all impeccable. Three Michelin stars...I could find no fault. Seated next to us was Soviet statesman Mikhail Gorbachev. Another peak experience was the Burj Al Arab in Dubai. One of my chefs from Sea Dream worked there and we had a VIP tour and lunch. These experiences are not to be missed. Q: Now you’re making me hungry for another voyage and for one of your recipes too. Can you share a chocolate dessert recipe? I’d love to! This is a favorite and not difficult to make at home. * Purchase or make your own reduction using high quality balsamic vinegar. Preheat the oven to 350F and butter a 9′′ spring form pan. Cover the bottom of the pan with parchment, and butter the parchment. Combine 1 2/3 cups chocolate chips with 3/4 cup butter in a saucepan. Melt over low heat until completely smooth. Whisk in the cocoa powder and vanilla, and let cool for at least 10 minutes. While the chocolate is cooling, combine the 5 eggs with 1 cup of sugar and 1 tsp salt and mix on high until very thick, about 6 minutes. Carefully fold in the chocolate mixture, and pour the batter into the prepared pan. Bake for 42-45 minutes. The center will fall, and edges will remain lofty. Let the cake cool in the pan for an hour before using a spatula to press the edges down to the same height as the center. Invert the torte onto a plate, and remove the parchment. Let cool completely. Cut in desired shape, top with a bit of Balsamic Mascarpone Cream and enjoy!